The Consumer Financial Protection Bureau on Thursday announced that it would ease certain mandatory reporting requirements for issuers of home equity lines of credit — including Home Equity Conversion Mortgages. Beginning January 1, 2018, financial institutions that have originated 500 home equity lines will be required to submit certain information about borrowers to the CFPB under the Home Mortgage Disclosure Act. That’s a significantly higher threshold than the 100 originally set to go into effect on New Year’s Day under previous guidance. “The temporary increase in the threshold will provide time for the Bureau to consider whether to initiate another rulemaking to address the appropriate level for the threshold for data collected beginning January 1, 2020,” the agency said in a press release. The CFPB originally pitched the idea of a threshold increase back in July, which prompted the National Reverse Mortgage Lenders Association to write a letter in support of the plan — though the Washington, D.C.-based trade group also asked for a delay of the January start date, which remains in force. In the initial letter, Irwin cited the burden of collecting HMDA-required information from borrowers, concerns over data security, and the potential cost of HMDA compliance software specifically designed for HECMs. 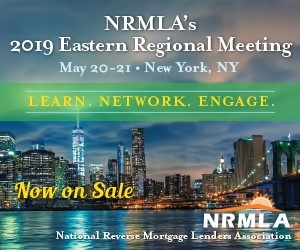 “We note that there are very few reverse mortgage vendors, which makes it more difficult to find and implement alternatives in implementing the revised HDMA requirements,” Irwin said in the initial letter, adding that NRMLA members have reported that the rules would “significantly” increase costs for originators. The CFPB initially proposed the reporting rule for home equity lines of credit back in 2015, claiming that the products helped contribute to the “overleverage” that eventually led to the mortgage crisis in the mid-2000s.